After weeks of sun the rain is thwarting my plans to photograph my third and fourth Simplicity 2444 dresses. 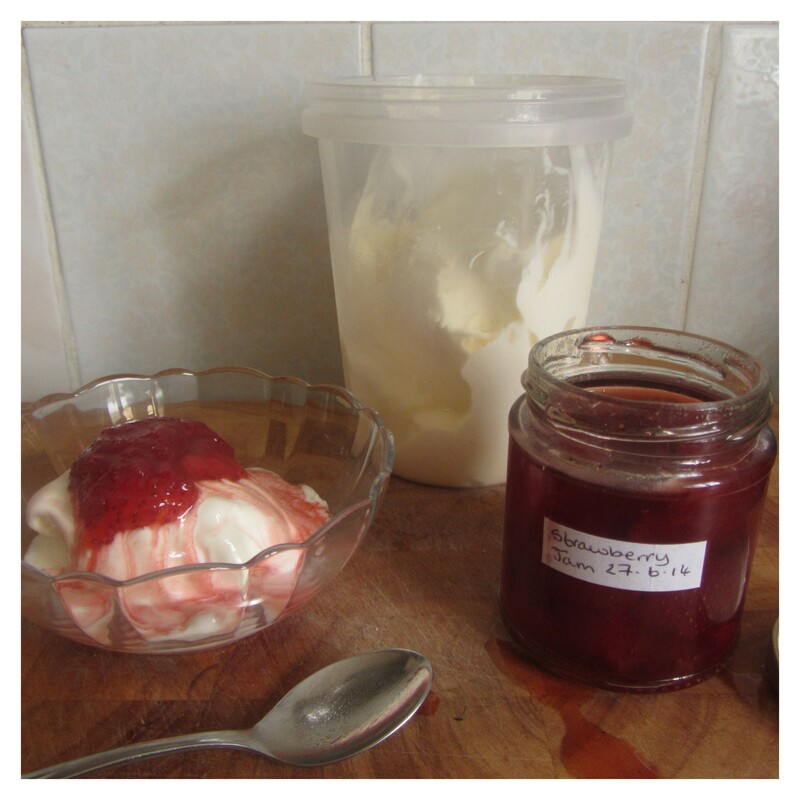 So, feeling sorry for myself and remembering some ‘jam’ my mum gave me a few weeks ago, I decided to experiment with a vanilla ice cream recipe. Hopefully more successfully than mum’s attempt at jam, which turned out like syrup with strawberries in (love you, mom!). Most ice cream recipes call for a custard type cooked base with eggs, but seriously, that’s like double time wasting with cooking on a stove and cooling when I just want to eat the stuff. 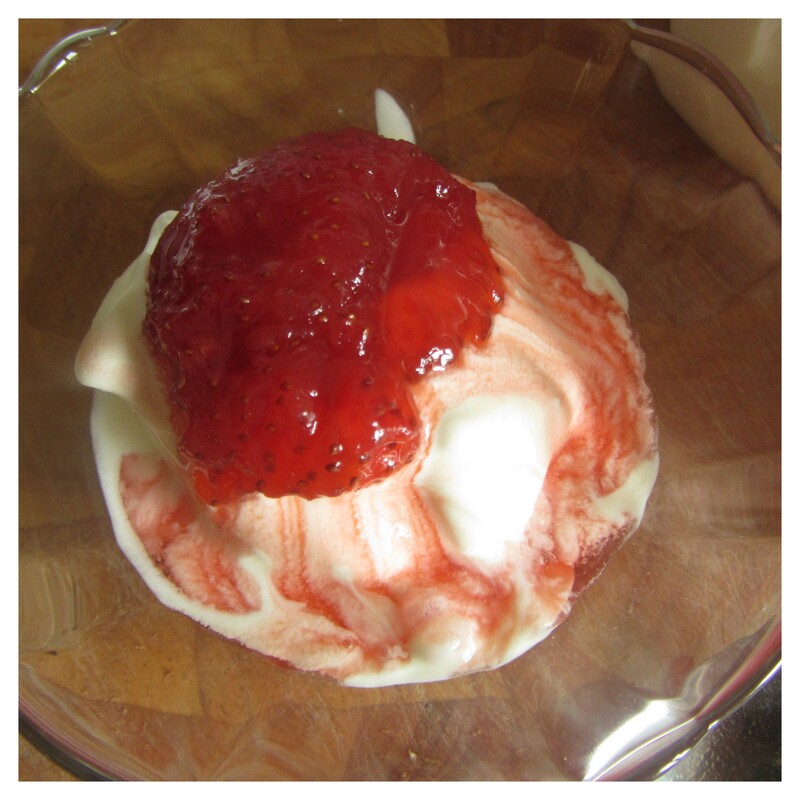 So I looked around via google and then decided to create my own egg-less recipe. I tried to make there be absolutely no cooking involved, but the damn sugar just wouldn’t all dissolve with stirring only, so this recipe still involves microwaving and a small amount of cooling time. Maybe if I’d bothered to get out the whisk then it could have been avoided. Ahhh, the trade offs. The mix tasted delicious before it went into the machine, not that I drank some or anything. I’m not normally a vanilla fan as there are so many better flavours, but to me, this is creamy, sugary, vanillary goodness, perfect for random toppings. Vanilla snobs may disagree. I don’t mind. Also, I’m not going to lie, after I stuck some in a bowl to take blog photos, I had every intention of eating the rest out of the tupperware while I snuggled in blankets, but I just couldn’t manage it. This stuff is seriously creamy. Maybe it’s the vanilla, as I didn’t have that problem with a chocolate version last week. Although I did have a small ‘helper’ desperate to get at least his fair share (and me to get somewhere near mine). * I used skimmed because that’s all I ever have, but any type should work. In a microwave safe bowl or jug, mix the milk and sugar well. Heat in microwave for 1 minute. Stir. Repeat if all sugar has not dissolved. Cool for as long as you can wait! Mine was room temperature-ish. Either place in fridge, surround jug with cold water etc. 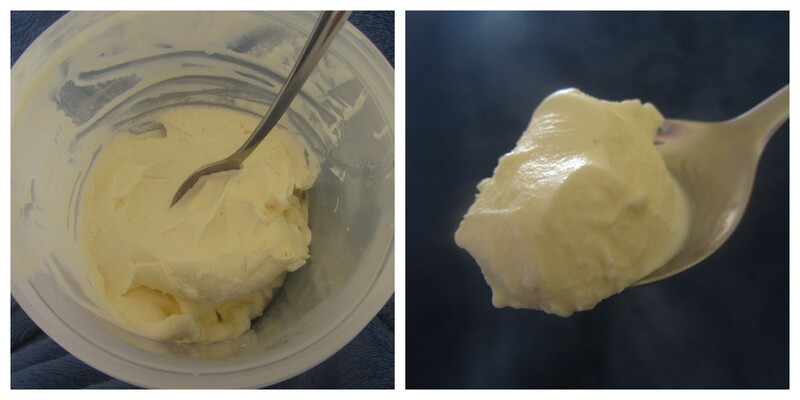 Place mixture in ice cream maker according to manual and wait until churned. Mine took about 20 minutes, but this will vary between machines. (Find some super runny jam). Serve! Cost: £1.22 for about 450-500ml of ice cream.